The two-day meeting of the Federal Open Market Committee (FOMC) was the focal point last week, concluding with a unanimous decision to keep the range of the federal funds rate unchanged between 2.25% and 2.50%. This decision was widely expected by financial markets, but the committee’s increased caution regarding the outlook reaffirmed its wait-and-see approach to monetary policy. The committee downgraded its assessment of the economy, with officials’ median projection for growth this year dropping to 2.1% from 2.5% previously. With this more reserved outlook, the committee scaled back its expectations regarding tightening and now looks to be on hold for the rest of this year. Does this suggest the FOMC believes it has reached its neutral policy rate? Taking the dot plot at face value would suggest there is still a modest preference to hike rates 25 bps next year. But, given the patient tone of the FOMC and its data-dependent approach, it remains a close call on if the next move would be a hike or a cut. The Leading Economic Index rose 0.2% in February. While the index continues to suggest a solid pace of growth, the positive contributions to the index have been getting smaller on trend suggesting some temperance. This is clearly seen in the interest rate spread component, as the spread between the 10-year Treasury and fed funds rate has continued to fall, although it has not fallen into negative territory. If the yield curve inverts, market apprehension of a recession will heighten. These lower rate expectations came alongside a modest downgrade to real GDP growth to 2.1% in 2019 (previously 2.3%) and 1.9% in 2020 (previously 2.0%). The unemployment rate forecast was raised two-tenths in 2019 and 2020, and one tenth in 2021. Inflation expectations, however, were unchanged, suggesting that the Fed’s expected monetary policy path should keep inflation on target. US stocks closed lower for the week after a sell-off on Friday took the broad S&P 500 Index down from five-month highs reached the day before. A plunge in longer-term interest rates seemed to be the primary market driver and took a heavy toll on financial shares by threatening lower bank lending margins. Conversely, the prospect of lower rates helped the small real estate sector, which performed best within the S&P 500 Index. Technology and other growth-oriented shares also continued to outperform value stocks, which are typically more sensitive to economic conditions. Investors may have also been concerned by drops in IHS Markit’s gauges of both service and manufacturing activity in the US. The Commerce Department reported that factory orders had risen only slightly in January, while shipments had declined for the fourth consecutive month. A gauge of manufacturing activity in the mid-Atlantic region indicated healthy expansion and surprised on the upside, however. The generally downbeat tone of global economic data and the dovish signals from Fed officials sent longer-term bond yields down sharply. The yield on the benchmark 10-year Treasury note approached 2.4% in trading Friday, its lowest level since December 2017. The drop caused the yield on the 10-year note to fall below the yield on the three-month Treasury bill, resulting in a partial inversion of the yield curve. Inversions over the two-year to 10-year range (which was narrowly avoided) have reliably signaled an oncoming recession in past decades, but the extraordinary measures by central banks in recent years to hold down long-term interest rates may be making the signal less reliable. In the US, PCE core inflation numbers for January are released on Friday. Based on the CPI index, PCE core is expected to rise 0.2% month-on-month (unchanged at 1.9% year-on-year) which is just below the Fed’s 2.0% target. Moreover, private consumption growth for Q4 is also to be released this week on Thursday. This coming week also brings housing market numbers for February on Thursday. Recently, the housing market has started to show a bit weakness especially home sales numbers, which is expected to be driven by higher mortgage rates. However, housing market data are quite volatile. British retailers racked up surprisingly strong sales last month, reinforcing how spending by consumers is a bright spot for the economy ahead of Brexit. Retail sales grew by an annual 4.0% in February, the top end of a range of forecasts by economists in a Reuters poll, and down only slightly from January’s two-year high of 4.1%, official data showed on Thursday. Mild weather last month boosted spending at garden centres and on sporting equipment, offsetting a fall in spending at supermarkets and in clothing stores after sales promotions in January, the Office for National Statistics said. British private-sector employers expect to give staff a basic annual pay rise of 2.5% this year, the same as in 2018, though some will delay awards until after government Brexit plans are clearer, an industry survey showed on Thursday. 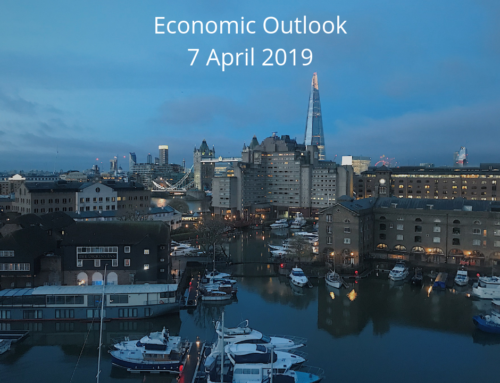 British wage growth rose to its highest in a decade at the end of last year at 3.5%, and the Bank of England sees only a slight slowdown in 2019 as employers struggle to find staff in the face of the lowest unemployment in decades. This week, PM Theresa May is expected to bring back her deal for a vote in the House of Commons on Tuesday or Wednesday following the EU’s decision to extend Article 50 to 12 April unconditionally. As the positions among the politicians have not changed yet (actually, they may have hardened after May in her speech Wednesday indicated it was the members of parliament’s fault, not hers, that Brexit has not been delivered yet). The House of Commons will probably try take over the decisions by demanding a series of indicative votes on the best way forward. The House of Commons is likely to force May to ask for a long extension eventually. It is also important to understand whether May in one way or another is about to resign, as the Conservatives are getting increasingly tired of her (but they are not able to force her to resign through a no confidence vote, after she survived one in December). With respect to data releases, consumer and business confidence indicators are due out on the night between Thursday and Friday. In particular, business confidence has declined, with the Lloyds Business Barometer at its lowest level since the European debt crisis. The eurozone Composite PMI index disappointed with a decline to 51.3 in March from previous 51.9. While service confidence was stable as expected, the manufacturing confidence unexpectedly continued its decline from the beginning of 2018 and at 47.6 reached the lowest level since 2013. Overall the PMI Composite index is still comparable with fairly stable GDP growth in the first quarter compared with fourth quarter 2018. Especially German Manufacturing PMI disappointed with an even steeper decline in March to 44.7 (previous 47.6); the most pessimistic reading since July 2012. Even if a part of the weakness still can be explained by the auto industry (strikes and changes to new model lines) as indicated by a rise in suppliers delivery times to the highest level since 2012, its worrying that new orders (and export orders) was the main drag behind the decline. The French Composite PMI index fell back below the 50 threshold, and has now stayed below that in three out of the past four months. Especially new orders was a drag on the index, where export orders decreased to a three year low. Yellow Vests protest and postponement of the Algerian election was blamed for playing a part in the weaknesses. Despite the looming Brexit deadline, the STOXX Europe 600 Index was little changed through the first four days of the week before Friday’s manufacturing data sent stocks lower. In the euro area, there are a number of ECB speeches on Wednesday as part of the ECB watchers conference in Frankfurt. Mario Draghi, Peter Praet and Luis de Guindos will all participate with a first public appearance on monetary policy since the March package. Naturally Draghi’s keynote speech and Praet’s participation in the ’normalisation of monetary policy’ panel will be closely watched. In Germany, the March Ifo prints are due to be released on Monday. After last week’s uptick in ZEW expectations investors are becoming on balance a bit less pessimistic on the euro area/Germany outlook. It will be interesting to see if this is also reflected in the Ifo reading, which usually is a better predictor of the real economic momentum than ZEW. On Thursday, the German preliminary inflation data for March are out. Headline inflation has stayed muted at 1.7% YoY over the past three months and there could be scope for a small rise to 1.8% YoY on the back of the recent increasing oil prices. Mainland Chinese stock markets rose for the second straight week as domestic investors stayed confident that the government would continue to step up easing measures to counter China’s slowing economy. For the week, the Shanghai Composite Index rose 2.72% and the large-cap CSI 300 Index, considered China’s blue chip benchmark, added 2.37%. The latest week’s advance came a week after China wrapped up its annual National People’s Congress meeting, during which Premier Li Keqiang told reporters that Beijing was keen to bolster the real economy and prevent large-scale layoffs, as well as considering cutting some interest rates and banks’ reserve requirements. The possibility of a trade deal with the U.S. in the coming weeks also helped sentiment. On Friday, President Trump said in a televised interview that “we’re getting very close” to a trade deal with China, despite other reports stating that both countries remain far apart on a variety of issues. Trump’s comments came as U.S. Trade Representative Robert Lighthizer and Treasury Secretary Steven Mnuchin prepared to travel to Beijing for the next round of face-to-face talks on March 28–29. High-level trade talks between US and China will resume in Beijing this week with the aim of closing a deal soon. US Trade Representative and Treasury Secretary Stephen Mnuchin is set to lead US talks with China’s top negotiator Vice Premier Liu He and his team and the following week the Chinese high-level trade team is planned to head for Washington. According to some sources, the hope is to pave the way for a ‘signing summit’ between Xi and Trump in late April. Sources: T. Rowe Price, Reuters, MFS Investment Management, Danske Bank, Handelsbanken.